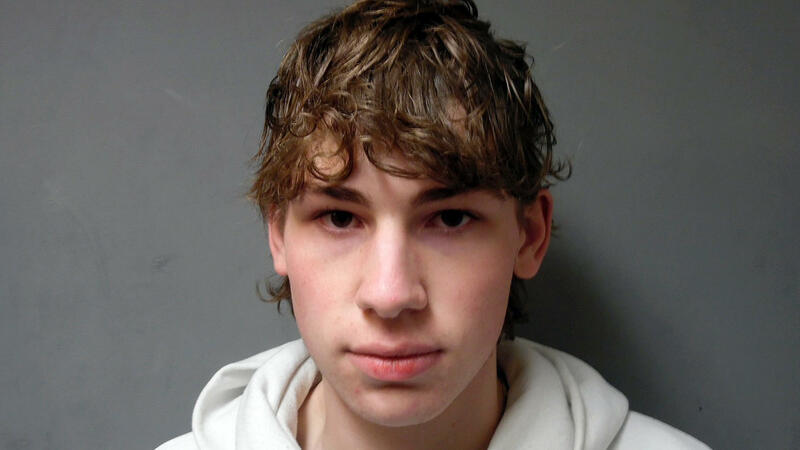 This file photo released Feb. 15, 2018, by the Vermont State Police shows Jack Sawyer from Poultney, Vt., accused of planning "to shoot up" his former high school. Jack Sawyer, 18, is accused of plotting a mass shooting at his former high school in Fair Haven, Vt. He was arrested on Feb. 15, just one day after a shooting at a Parkland, Fla., high school that left 17 people dead, and several others wounded. Now, Sawyer faces felony charges of attempted first-degree murder, attempted aggravated murder and attempted assault with a deadly weapon – crimes which carry a potential life sentence without the possibility of parole. The case has fascinated legal experts who say it is forcing Vermont to grapple with the difficult issue of when intent to do something becomes an actual crime. On the day of the Parkland tragedy, he allegedly sent Facebook messages to a friend saying he approved of the shooting and was planning to shoot up his own former high school. There were also social media posts attributed to Sawyer, under the pseudonym Klebold — a reference to Dylan Klebold, one of the shooters in the deadly 1999 Columbine school shooting that reportedly fascinated Sawyer. Prosecutors say Sawyer moved back to Vermont from a school for troubled teens in Maine and, in February, he bought a shotgun and ammunition, allegedly, to carry out his plan. And then there's the 31-page diary Sawyer allegedly wrote titled, "Journal of an Active Shooter." An entry dated Dec. 1, 2017, references Fair Haven Union's School Resource Officer Scott Alkinburgh. "The biggest thing I'm trying to figure out right now is how can I get as far as I can into the shooting before cops bust me first and shoot me dead. I know that I'm going to have to take officer Scott out first, but what's the best way? I'm thinking that I'll go in a few days prior to scope things out and see if he can typically be found in his office. I'm intending to just blow his f****** head off before he can even draw his gun or think about what's happening, but I can only hope with that one. If he kills me first, all of this will be pointless since I won't make the impact and chaos I plan to create. I don't think it'll be too big of an issue figuring out though. Probably just shooting his head point blank is the best way to go." But long-time defense attorneys counter that Vermont sets a high bar when it comes to proving a crime was attempted. "In Vermont in order to prove an attempt you have to prove intent to commit a particular crime and you have to prove that they took an overt act towards the commission of that crime," says attorney David Sleigh. "The crime also needs to be stopped or interfered with by some outside action." Attorney Dan Sedon says proving intent is hard enough, but it becomes even harder when the case involves a teenager. "Because teenagers are to some extent prone to dramatic statements and dramatic gestures," he says. Neither attorney is involved in the case. Vermont Defender General Matthew Valerio, whose office is representing Sawyer in his criminal case, takes it a step further: "The bottom line is there likely wasn't even a crime here." But Rutland County State's Attorney Rose Kennedy argued in court that had the state waited until Sawyer showed up at the school and began shooting, people would have died. Administrators at Fair Haven Union High School say they're extremely disappointed with the court's ruling and have had to reassure parents that they've got adequate security in place. Vermont Superior Judge Thomas Zonay ruled last month that Sawyer's words and actions went beyond mere preparation and warranted continued incarceration without bail. Defender General Valerio says he wasn't surprised to see Judge Zonay's ruling overturned by the state's Supreme Court. "I can sit around all day with a list of the people I don't like and talk about the ways I'd like to hurt them and what I'd do if I had the chance," Valerio says. "But that's not a crime that's fantasy." Sleigh agrees and applauds the high court's decision. "They got the law exactly right and didn't give in to the temptation of abandoning 100 years of precedent to address a situation that's caused widespread panic," he says. Sleigh believes had the court ruled otherwise it would have set a dangerous precedent. "Where does this expansion stop when we have high publicity incidents that we don't want to see re-occur, and where does the intersection between preventing possible wrong bump up against the interference with someone's ability to think and speak?" Sleigh asks. "I think that's a serious concern and I think Vermont has distinguished itself over the years with a very high bar to prove attempts in these sorts of situations." Sleigh and others say the Supreme Court's ruling effectively reverses Judge Zonay's earlier decision and makes a dismissal likely. Kelly Green, Sawyer's defense attorney says a renewed motion to dismiss has already been drafted. Rutland County State's Attorney Kennedy, who's been prosecuting Sawyer, didn't respond to requests for comment, but told the Rutland Herald she was incredibly disappointed in the supreme court's decision and its interpretation of Vermont law. The Supreme Court addressed that very issue in what some legal experts say is a unique addendum to their ruling. The court wrote in closing, "The Legislature is tasked with enacting such laws as the people of Vermont think necessary. This court is bound to apply the law in agreement with statute and this Court's own earlier decisions. The Legislature can, if it chooses, deviate from this long-established standard by passing a law revising the definition of attempt." Vermont defense attorney Dan Sedon believes that's exactly what lawmakers need to do so the courts have another option, a charge that would fall between disorderly conduct and attempted murder. "We ought to come up with something akin to 'you can't shout fire in a crowded theater' and 'you can't talk about shooting up schools,'" Sedon says. "There's no legitimate speech content there that's justified by the First Amendment." Other states, such as Minnesota and New Jersey, have enacted such laws involving terroristic threats and Sedon believes it may be time for Vermont to follow suit. Following Wednesday's ruling, prosecutor Rose Kennedy filed an application in Rutland Superior Court late Thursday for an Extreme Risk Protection order, utilizing a new law that was signed by Vermont's Governor just the day before. The law provides a civil process to seize firearms from those deemed to pose an "extreme risk" of harm to themselves or others and was part of a package of gun control legislation passed in the wake of the Parkland shooting and Jack Sawyer's arrest. A hearing on the matter has been scheduled for April 25.